We were aware that shrimp’s will molt, which is the shedding of the old exoskeleton to make way for new growth, but were not aware that crabs did. We have pulled a few shrimp exoskeletons from the aquarium over the last few months, but haven’t seen any sign of molting from the crabs. It makes sense that they would molt, as they keep getting bigger, but we never thought of it when we saw an emerald crab exoskeleton lying lifeless on the rocks. This really bummed us out, as we recently had a peppermint shrimp die, and started to wonder if we were doing something wrong. We pulled the emerald crab molt out and threw it away. Upon researching why crabs die on forums, we found that the molt of crabs look so perfectly like a dead crab, aquarists often mistake them for such. So we pulled the molt back out from the garbage and sure enough, it was completely hollow. The eyes were missing, and when we first saw it assumed that another crab had eaten them, but now think that this is where the crab exits it’s old shell. A few days later we saw all three of our emerald crabs at the same time, accounting for them all, and one had a new shiny green shell. 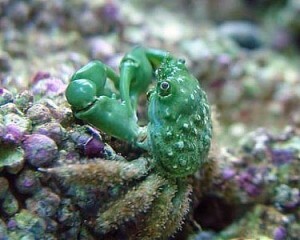 This entry was posted in Informational and tagged aquarium, Emerald Crab, molt, saltwater. Bookmark the permalink.